For one week, millions of young people around the world join a growing movement of entrepreneurial people, to generate new ideas and to seek better ways of doing things. Countries across six continents come together to celebrate Global Entrepreneurship Week, an initiative to inspire young people to embrace innovation, imagination and creativity. To think big. To turn their ideas into reality. To make their mark. 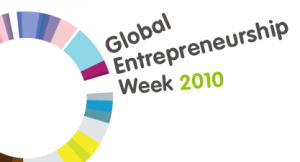 From 15 – 21 November 2010, Global Entrepreneurship Week connects people everywhere through local, national and global activities designed to help them explore their potential as self-starters and innovators. Students, educators, entrepreneurs, business leaders, employees, non-profit leaders, government officials and many others participate in a range of activities, from online to face-to-face, and from large-scale competitions and events to intimate networking gatherings. Through this initiative, the next generation of entrepreneurs are inspired and can emerge. In doing so, they will begin to acquire the knowledge, skills and networks needed to grow innovative, sustainable enterprises that have a positive impact on their lives, their families and communities.